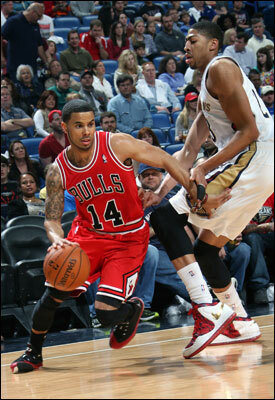 There were a lot of issues for the Bulls Saturday that led to the 88-79 loss to the New Orleans Pelicans. The Bulls missed layups, two in the first four possessions, a harbinger of miscues to come. 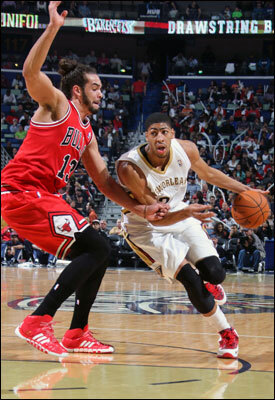 The Bulls admired numerous loose balls Pelicans’ players gathered in like Mardi Gras beads. The Bulls shot free throws like they were contested jump shots and shot jump shots, well, like they usually do, which is not good. They were dominated in the paint and beaten on second shots. They kicked the ball around and watched the Pelicans dance in for layups. There were just two words for everything that went on: Anthony Davis. Did anyone get the license plate number of that space shuttle? “He’s a great player, great player,” said Joakim Noah as he was on the way to get some postgame stitches for a fall on his chin that perhaps symbolized the night. The Bulls were leaving New Orleans beaten, bandaged and bloody. Noah was pretty good himself with 14 points, 16 rebounds and five assists, his 18th consecutive game with double figure rebounds, two behind Artis Gilmore for the third longest such streak in franchise history. D.J. Augustin back in his native New Orleans had 23 points and seven assists and Taj Gibson added 17 points, 10 rebounds and three blocks, though most in the fourth quarter after the Bulls fell behind by 15 with under five minutes left and were pretty much defeated. The Bulls went back to 23-23 while the Pelicans are 20-26. But the spectacular Davis was the story. There’s been discussion of late of how he wasn’t selected for the All-Star game, though with Kobe Bryant probably out with injury he could be added for the game in New Orleans by commissioner Adam Silver. Call it a slam dunk for Silver if he does. If you selected the best power forward in the NBA today you’d probably be in a debate among LaMarcus Aldridge, Blake Griffin and Kevin Love. If you had to pick one guy for your team going forward it would be Davis. Davis, from Chicago and Perspectives Charter High School, finished with 24 points, eight rebounds and six blocks. He leads the NBA in blocks while averaging 20.4 points and 10.4 rebounds. He had 51 blocks in January to not only lead the league. But it was more than the combined total of each of three teams, the Heat, Cavs and Jazz. Davis even has come up with a nice 18-foot jump shot he makes consistently. In Davis’ last three games, he is averaging 25.3 points, 11.3 rebounds, seven blocks and two steals. And the difference with all those aforementioned power forwards is Davis plays defense. His team generally isn’t very good at it with all the injuries they’ve had this season. They did hold the Bulls to an opponent low of 79 points, though other teams have done that. The Bulls offense makes defenses smile. But Davis soon is going to be the Defensive Player of the Year just about every season. Not only does he protect the rim with his blocks, but he is so quick he went outside on Noah and blocked his jump shot. Davis changed numerous shots to the point the Bulls, who generally dominate other teams in the paint, seemingly gave up trying to shoot inside. Enough of the humiliation and embarrassment. There’s another game coming up. Carlos Boozer had one of his poorest games as a Bull with four points on two of eight shooting and Gibson had two points on one of five through three quarters when the Pelicans led by 14. Yet, that’s not even the most amazing part about Davis. He practically covers half the court and basically defends both players on the pick and roll himself. He’s obviously getting tired of no one else playing much defense. So he’s doing it. On the Bulls pick and rolls, which they run constantly, Davis played the ballhandler coming off the screen and turned him away from the basket. Then he’d get back and in the way to deny the pass to the roll man. And this was with good pick and roll players like Augustin and Noah. Thanks to you know who. Whom? Apparently not the Western Conference coaches. Yes, we know the coaches like to vote for winning teams’ players. But this is a game for stars, and Anthony Davis is a star. He was way too much for the Bulls. No other starting Pelican—geez, you hate to refer to a player that way—scored in double figures. Tyreke Evans off the bench had 11 points, the only other water bird to score in double figures. He shot four of 15 to do so. Jimmy Butler, though shooting poorly at two of nine—Hey! Was that Davis? Duck!—did a nice job containing Evans and Eric Gordon, the latter who was four of 15 shooting. There weren’t many Bulls who could be proud of their shooting with Mike Dunleavy one of six and the team three of 16 on threes. They also were just 22 of 33 on free throws. So they were trying at times to score inside. But they apparently were worrying Davis would also block their free throws. But otherwise Mrs. Lincoln, how did you like the play? Yes, it went from bad to “Any help coming from the D-League?” pretty quickly as the Bulls started out trailing 8-0 with a couple of point blank layup misses. Davis was everywhere. The Bulls got a big first half from Augustin with 17 points with nice shooting off the pick and roll and some fancy passing, once going deep into the paint and rifling a pass 30 feet out on top to Dunleavy for a three. That helped the Bulls get within 23-21 after one quarter. Noah finished with 14 points, 16 rebounds and five assists, his 18th consecutive game with double figure rebounds, two behind Artis Gilmore for the third longest such streak in franchise history. The Bulls could dispense with that and maybe a wave goodbye to New Orleans. Noah will be back in a few weeks for the All-Star game. And even he couldn’t do much with Davis. As good a defender as Noah is, Davis drove on him, made jump shots as Noah contested and did everything but swat the “Adam Silver” signature off the new game balls. The Pelicans took control in the second quarter in a game that really never would be close after that. It was a brutal Bulls start to the quarter after Gibson tied the game with a pair of free throws to make it 23-23. The Bulls so like that number they stayed on it much of the quarter. Pressure defense and good scouting thwarted the Bulls as Gibson twice in a row stepped into double teams and lost the ball as the Pelicans were ready for his baseline spin move every time. It took him until well into the fourth quarter to adjust. Tony Snell paid a courtesy call and was Hesitant Tony again, reluctant to shoot. Thibodeau lifted him quickly enough. Dunleavy got stripped driving, Gibson committed an offensive. The Pelicans with a rag tag group of Anthony Morrow, Austin Rivers, Jeff Withey and Greg Stiemsma hung a 12-0 run on the Bulls to take a 35-23 lead that went to 50-39 at halftime as Pelicans coach Monty Williams rode his reserves much of the second quarter. It was no contest as the Pelicans bench had a 25-3 halftime edge on the Bulls’ reserve group. “We just got to make shots,” said Thibodeau. It proved easier said than done as usual with Davis now rested and relentless. The Pelicans kept the pressure on with Davis scoring on a powerful dunk on a pass from Al-Farouq Aminu and then picking up yet another loose ball the Bulls were admiring and slamming that through for a 60-45 lead midway through the third. Meanwhile, Boozer was going up tentatively and having Stiemsma throw his shot into the stands as the Pelicans had 14 total blocks. Boozer did have the rare Quad Four of four points, four rebounds, four turnover and four fouls. The Bulls found themselves almost looking around for Davis by the fourth quarter as they passed up shot after shot, several times running out the shot clock. Davis one time stripped Noah trying to dribble the ball and made a pass on the other end for a score and Noah was so frustrated he even was fouling Davis 20 feet from the basket. And Davis made the shot. The Bulls never got their deficit below double digits until the last minute of the game when Gibson scored seven straight points. It’s the Thibodeau mantra. Just play harder. But sometimes the other guys’ talent is just too superior. 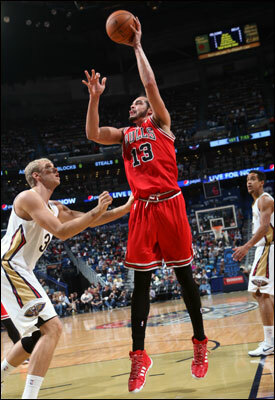 The Bulls’ nemesis as a team tends to be high scoring, athletic teams as the Bulls prefer a slower, more physical game. They don’t do much of that in the Western Conference. It could be a long week. There’s no more guys around like him, are there?